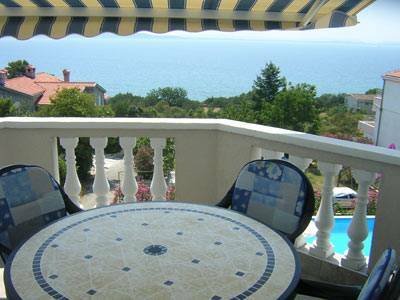 Apartments with swimming pool (100 m. far from sea) and Boat with fishing, cruising and diving program. 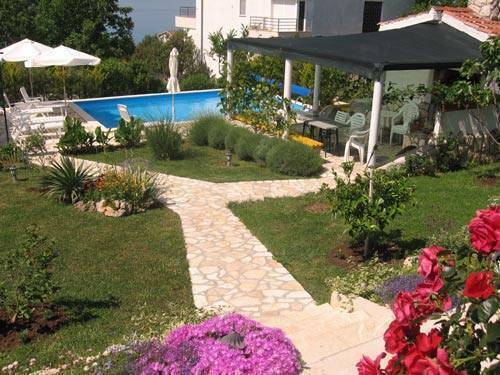 Completely equipped apartments with two bedrooms, a kitchen, a living room with terrace which have a view of the sea, parking place, grill in the garden with a kitchenette and a terrace, a swimming pool in the house garden. The price of renting an apartment includes linen, towels (fresh ones every 7 days), equipped kitchen, electricity and water consumption, a satellite TV, using the pool and final cleaning. Taxes Not Included 1 E/day/person. A3 apartment 32 m2 = one bedroom, bathroom, living room with couch, kitchen, balcony 3 m2 - sea view. 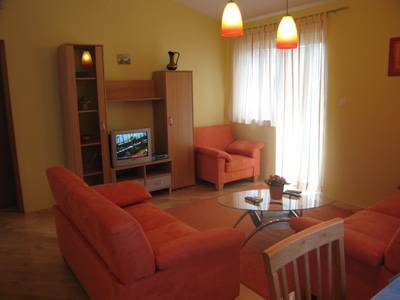 A2 apartment 52 m2 = two bedrooms, bathroom, living room with couch, kitchen, terrace 14 m2 - sea view. A4 apartment 75 m2 = two bedrooms, bathroom, living room with couch and armchair, kitchen, terrace 17 m2 - sea view, Dishwasher and Washing Machine. A5 apartment 75 m2 = two bedrooms, two bathrooms, living room with two couchs and armchair, kitchen, terrace 17 m2 - sea view, Dishwasher and Washing Machine. Additional offer - meeting and transfer in case of arriving by bus (12 E) or plane (25 E). Optional, breakfast and supper in the little tavern, or on the outside grill terrace with a Dalmatian menu and domestic wine, according to your wishes. 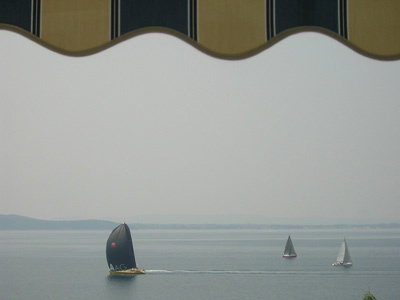 Offer plus: BOAT: We offer several programs (adjustable to your desires). It is up to you to choose among: daily cruising, daily, night or several-days fishing, diving. By preparing this program, we thought of all of those who do not have the opportunity to spend longer period of time on the sea, and who would like to enjoy in the beauty of our islands, their bays, isolated beaches or idyllic localities with gourmand specialties. It is human to have a weak point, but those knowing well Croatian islands have thousand of them, precisely 1185. Namely, along 1777 km of the Adriatic coast there are exactly so many islands and reefs. Thanks to its spacious cockpit, motor boat Princess 32 (9. 90 m.) is particularly suitable for cruising, sport fishing and diving. Technical data: Princess32 Length: 9, 70; beam: 3. 00 Engine: 2 x 150 HP diesel Cabins: 1 + saloon (5 berths), toilet. Kozino is a place with numerous modern villas and apartments, situated just 5 km to the north of Zadar, and it is an ideal destination for tourists looking for quiet in a little place of a gentle and friendly atmosphere. 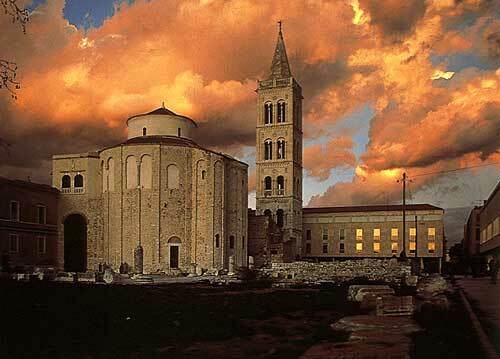 Zadar is a town of long and rich history with full of cultural monuments, lots of churches an museums. Breakfast or supper (or both) in the little tavern, or on the outside grill terrace with a Dalmatian menu and domestic wine, according to your wishes. Choice of specialities is done together a day before. person under 12 age old. on our web pages, address is 13 ulica no. 69 Kozino-Zadar. Please print that and than you don't have problem for find.